Today makes a month and a half that I have been on my weight-loss journey. I weighed myself this morning and I gained 1.4 pounds bringing down the total to 20 pounds loss. I was pretty upset with the weight gain for just a minute. Thinking back to The Biggest Loser, you see some of the contestants gaining weight even though they are working super hard. I know it is my body trying to fight back and hold on to what it is used to. Even though I gained the weight I am still pushing on. Every day I feel like this is getting easier, I feel like it's just a regular part of my day. I don't even feel like I am on a diet anymore. I have been making a lot of smart choices on what I eat. I haven't touched soda or juice since I began. I just feel like it is a waste of calories. I gave up all artificial sweeteners because in the long run all it does is make you hungry. I learned that it is good to eat healthy fats and things like avocado and nuts. Eating fat-free foods doesn't satisfy you the way healthy fats do. Being active during the day is so easy now too. I have so much energy from the good foods I have been eating and from the 20 pounds off. 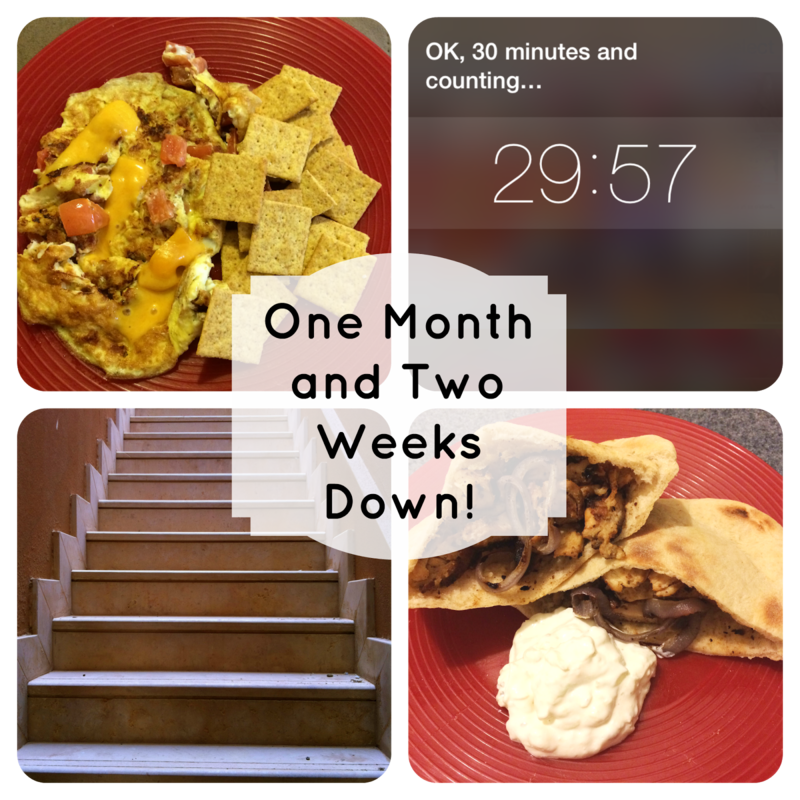 Last week I was proud of being able to go up the stairs with groceries and not feel winded. Today I am proud to say that I brought up all of the weeks groceries by myself, making multiple trips just because I could! I am still setting my timer to go off so that I can stay active. Instead of an hour of sitting I do 45 minutes of sitting/blogging/researching then 30 minutes of cleaning/organizing. I changed from 1 hour to 45 minutes because I just couldn't sit for an hour straight anymore. I would keep looking at the timer. This week I am trying the Skinny Jane Diet for 7 days. I got picked to review the diet which consist of protein shakes, supplements and a meal plan. I will be doing a 7 day diary of my experience and posting it next week. I am on a weight loss journey as well and feel your pain with the gain. Just remember that you didn't gain the weight in one week and you aren't going to lose it in one week. Don't let this small gain get you down! Power through it and come out the other side with a smile. Twenty pounds down? Wow! That's incredible. Congratulations, and keep it up. I'm losing weight too and there will be set backs. You're doing incredible. Keep it up and you'll not be sorry. Congrats on the weight loss! I need to get motivated myself. Good for you! I'd love to lose 20lbs like you have. I'm hoping to make time for exercise in my routine and watch what I eat better. No matter what, you'll feel better with the new lifestyle! I know it can be depressing to see a weight gain, but there are so many factors to consider. Keep it up! I love how motivated you sound and also being able to see and feel the results from the change to good choices. It does get easier when it becomes a normal part of your routine and you don't feel like you are doing a chore anymore. It does take up to a month or so to break habits we are used to. Thanks for sharing your journey and keep going and sharing so you can inspire others! It can be difficult at the beginning, but after losing it you will feel so proud! I know how difficult it can be. Hang in there and be proud of the changes you are making!! Good for you!! It will eventually trickle over to your children and they will ask for fruit for a snack! Keep it up! Can't wait to hear our reivew! It really does become a habit. Once you start you can't believe you waited so long! Michelle, you are doing SO well! Congratulations! I would not give it a second thought about the weight gain since you are eating so well and getting active. I've been watching myself for 14 months now, and I weigh myself less than once per month. In that manner, I'd get to see "the big picture", and not weekly fluctuations. Also, if my pants start to fit me a bit tight, I know it's time to pull myself back. Congrats on the 20lbs off!! I really need to push myself through my depression eating (my postpartum depression isn't being touched enough by my usual anti-depressants sadly, so I go in Friday to see what we go do) so that I can lose weight and feel better too! Do not be upset with weigh gain, as minimal as that.. our bodies fluctuate because they hold things in sometimes. Congrats on the current lose. Just don't give up! It takes time to lose weight as it took time to gain it all! I am with you in spirit. Ok, I should be on this diet with you. So I can't wait to hear at the end what you thought. You are still doing a super great job. Keep up the good work. Wow, you're doing great. Keep up the good work! It is just so amazing how good food makes us feel good! Good luck finishing up your last 2 weeks and then with the Skinny Jane diet. You have made some awesome changes, good for you! And if you gained only 1.4 pounds, that could just be a little water retention or maybe you gained some muscle. I wouldn't worry about it too much, if I were you! Way to go! I'm curious to see how you like the Skinny Jane diet. Keep up the good work - you are getting close! I'm also trying to lose weight and know how much work it takes. I am also on a weight loss program- I know how difficult it can be... keep up the good work! Congratulations on making it one month and two weeks into your diet and exercise plan, and on the 20 pounds. Even with the weight gain, you have achieved a lot! It's great that you understand why you gained it, though. Good luck! Congrats! You are doing such an awesome job! Keep it up! Way to go! Great job! I know when I started a weight loss journey -the first few weeks were the hardest. It got easier as time went on. Way to go again! Great job! Don't let the little gain get to you! I have tried working out and loosing some weight too but because of my lifestyle I can't keep up with it, so sorry for myself - I just need to flatten my belly and tone some muscles. It is so nice to hear that you are really working hard for keeping your goal and your awareness of few pounds added shows how serious you are - consider the situation too why you gained that in few minutes and maybe don't push yourself too much cos it is not good also. What's weird with me is I was able to lose weight easier when I was diabetic. Since I don't have diabetes anymore it's been tough staying away from carbs. Losing weight is truly difficult especially if you take a look at our current lifestyle today. Technology has made our life real convenient to the point that we don’t physically move enough to lose some extra pounds. It is really weird to note that there are more obese people on this earth compared to underweight people. This sounds too ironic for me. Anyway, I admire your perseverance and commitment, Michelle. Keep it up and stay healthy. I am sure you will achieve your ideal weight eventually. What your body is doing is totally natural. Believe it or not if you eat more for a day or two your body will forget you are trying to starve it and start losing again. Don't get upset with the few weight gain. Just keep on track and stay motivated on what you are doing and everything will just follow.. For me, i prefer weight gain. Fantastic 20 pounds!That is very impressive! Losing weight is a up and down battle! If you fall off - jump right back on the next day! CONGRATS! Congrats, you're doing great! The best part about this journey is the healthy habits you get to implement into your routine. Wow 20 lbs is AMAZING and don't beat yourself up over that small gain. It might be muscle? You're doing awesome for sure, and such an inspiration to me - I want to lose between 20-30. Hey, if you get a chance, link up with me over at Fitness Friday! We all visit each other for support! I'm putting up this weeks post later today. That's great! Congrats, 20 lbs. is a big accomplishment in such a short period of time! That is great. 20 pounds is a great amount to take off. Good job to you! 20 pounds in just 6 weeks is AWESOME!!! I think I need to follow your diet. I need to lose some weight myself and maybe will gain my energy back. Great job!